The news of the day: I want to share some information today about a class that is not part of our regular schedule. You cannot attend it as part of your RiversZen membership but you can still attend Monday’s class to check it out. 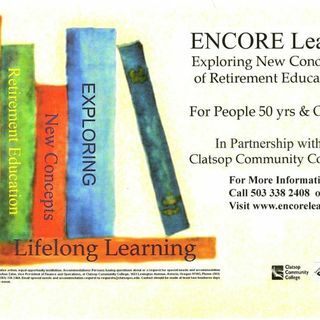 Starting next Monday at 10:00 am Kim will be teaching a class for ENCORE as part of Clatsop Community College’s Community Education series. ENCORE is a member-run organization for individuals ... See More who are 50+ years in age. They operate under the auspices of Clatsop Community College to offer short-term courses and activities, which are usually led by members. Membership is inexpensive and most events are offered at no charge. Preregistration for ENCORE classes is not necessary. If you are a member, just come to the class. If you are not a member but think that you might want to become one, just come to a class! You may attend two classes as a guest before becoming a member. If you have questions or wish to share comments head over to our Facebook page RiversZen Online Community or email us at info@riverszen.com or call or text us at 503-440-3554.